Oscar Del Real, second-year graduate student in plant science now works for the Dodgers. At least one Cal Poly Pomona student has a front-row seat during the World Series games at Dodger Stadium. 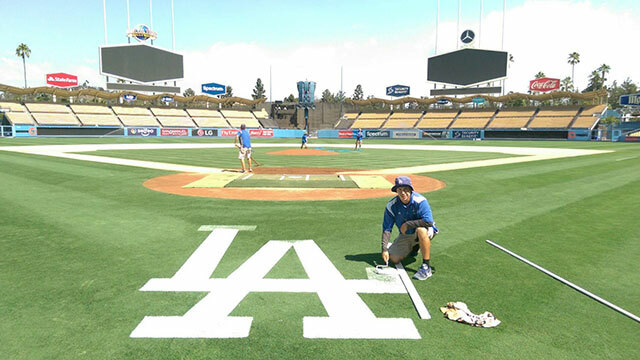 Oscar Del Real, a second-year graduate student in plant science, works full-time for the Los Angeles Dodgers grounds crew. 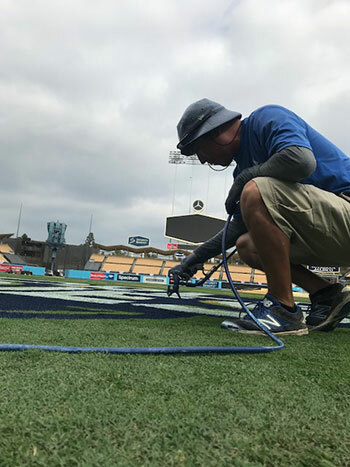 He helps out with everything from mowing the field’s grass – Bermuda hybrid over-seeded with perennial rye – to keep it cut short, maintaining the visiting team’s bullpen and painting logos on the field. Del Real becomes the second Cal Poly Pomona turf management student to work a professional sports championship this year. Sean McLaughlin won the Toro Super Bowl Sports Turfgrass Training Program contest and was the only college student to work with the grounds crew in February at Super Bowl LI in Houston. As a child, Del Real’s goal was to play for the Dodgers. But he eventually realized that he wasn’t good enough to play in the major leagues. Oscar Del Real paints the logo on the field. Del Real puts in at least 40 hours a week working with the Dodgers. The full-time employee has watched countless regular-season games and all of the home playoff and World Series games from the grounds crew’s clubhouse in right field or up close when he helps drag the infield between innings. The graduate student has worked in sports turf management for more than seven years now. Although he might stay in professional baseball for a few more years, Del Real eventually wants to teach. He currently volunteers to help prepare students for national academic competitions.